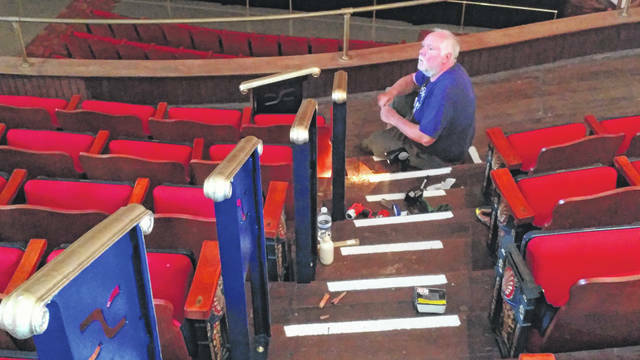 Professor of Art Kevin Lyles at the University of Rio Grande inspects handrails placed in the balcony of the Ariel Opera House. He and Dylan Collins of West Virginia University spent last week installing and painting the new rails in keeping with the performance center’s aesthetic. The Ohio Valley Symphony season will begin Sept. 8 and continue into spring of 2019. GALLIPOLIS — With the retirement of its old maestro, Ray Fowler, earlier this year, The Ohio Valley Symphony is preparing for another season with a variety of visiting conductors and talent as it begins a new chapter. Ongoing rehabilitation efforts for the Ariel Opera House are also in full-swing as additions to the balcony area of the building’s auditorium are being made. According to information provided by the Ariel Opera House, during his years as the guitarist for the Cincinnati Pops Orchestra, Tim Beren played guitar, banjo, mandolin and bouzouki on concerts, recordings, television programs, and tours. Beginning in the late 1990’s, Beren began arranging for the CPO, eventually becoming the orchestra’s principal arranger. He and colleague Michael Chertock will take the stage at the Ariel Opera House Sept. 8 at 7:30 p.m. as part of the The Emperor piano concerto. Chertock has fashioned a career as an orchestral soloist, collaborating with conductors such as James Conlon, Jaime Laredo, Keith Lockhart, Erich Kunzel and Andrew Litton. His many orchestral appearances include solo performances with the Philadelphia Orchestra, l’Orchestre Symphonique du Montreal, the Toronto Symphony, the Baltimore Symphony, the Naples Philharmonic, the Detroit Symphony, the Chattanooga Symphony, the Utah Symphony, the Oregon Symphony, the Indianapolis Symphony and the Dayton Philharmonic. Chertock has toured Asia with the Boston Pops and the Cincinnati Pops Orchestras. He made his Carnegie Hall debut in 1999 with the Cincinnati Pops Orchestra, performing Duke Ellington’s New World A’Comin’. Beren will also assist with folksinger Michael Johnathon in the program “Songs of Rural America” coming to the Ariel on October 6 at 7:30 p.m. The Ariel-Ann Carson Dater Performing Arts Centre will serve as the featured location for the program’s world premiere as it begins its tour. It will be not only recorded for broadcast on nearly 600 public radio stations, it will also air on American Forces Radio Network in 173 nations plus be filmed for a public television TV special.